One of the great things about sailing from Port Everglades in Fort Lauderdale is the convenience. Located just a few minutes from the Fort Lauderdale/Hollywood airport, it’s a simple 10-minute ride to the cruise ship and just a few more to get to the beach. Of course, not everyone who flies (or drives) into the area to take a cruise wants to go directly to the ship. Fort Lauderdale has a ton of things to do — from food to the beach to casino gambling to sightseeing. In fact, you could spend an entire vacation in the area without even setting foot on a ship. For those who want to spend some time in the area — or simply need a place to stay a night before their cruise — your options are numerous. As a tourist mecca there are hundreds of hotels in the area for you to choose. With so many hotels there are also a number of affordable options. If you’re looking for inexpensive hotels that are near the cruise port, then you are in luck. We’ve found nearly a dozen hotels within just a few minutes ride from the ships that are all under $100 a night. Prices come from a recent search for a Saturday night stay. Keep in mind that prices will vary based on when your travel dates. Distances are measured to Terminal 18 in the heart of Port Everglades. The actual entrance to the port will be closer than what’s listed below. The links below go to TripAdvisor where you can read reviews from travelers like you to help you pick the perfect hotel for your vacation. Note: This article contains links to TripAdvisor that are affiliate links. We earn a commission for clicks made on their website, at no charge to you. 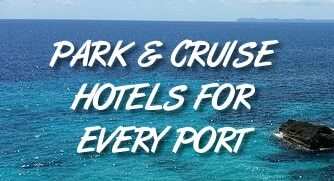 One of the most affordable options near the port, this hotel features a pool and easy access to the Marina Mile Boulevard, which takes you directly to the cruise ships. Next door to the Red Carpet Inn, the budget hotel location can’t be beat. It’s near both the airport and offers easy access to the Marina Mile Boulevard — one of the major roads through the city. Near Interstate 95 but on Marina Mile Boulevard, this hotel offers easy access to the cruise terminals. For less than $100 a night, it’s an easy spot to stay without stressing about getting to the ship on embarkation day. This is among the closest hotels to the port. Pictures on TripAdvisor show a place that could use some updating, but you shouldn’t expect the Ritz for being near the terminals at under $100 per night. A simple old-school hotel is an option for those interested in staying somewhere local instead of a chain. Prices were found for just over $80 during our search and it’s right near the midport area of Port Everglades. You can’t get better than this location. Right on A1A (the road that crosses just north of the port and heads to the beach), it’s walking distance to the northern-most cruise terminals. This is likely the best option for those who don’t want to stay at a chain. The cute hotel gets rave reviews (4.5 out of 5 on TripAdvisor) and features unique and lush landscaping you won’t find at a mass-market chain. It’s also just a short ride to the port. Situated just south of the airport in Dania Beach, this option is right near Highway 1 making it easy to get over the port on cruise day. There are also a number of restaurants and shopping areas nearby. Want to visit the beach? Most hotels on the beach are pricier but this Motel 6 is just a short drive to the ocean at Dania Beach. It’s just south of the airport and also right near a nature center that’s undeveloped if you don’t want to stay in the middle of development. A little further than some of the other hotels, this Super 8 is still close to the port. It’s also a straight shot down Highway 1 to the port area and the airport. If you are worried about navigating, it doesn’t get much easier to get to this hotel.